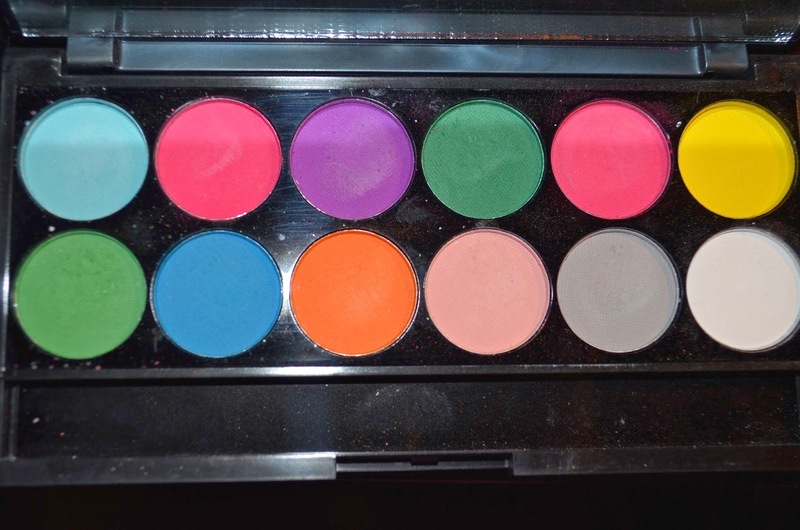 In this blog I am discussing the Urban Decay Electric vs the Sleek neon palettes. First the important things: I AM NOT PAID OR ENDORSE TO DO THESE BLOGS OR MY YOUTUBE REVIEWS. 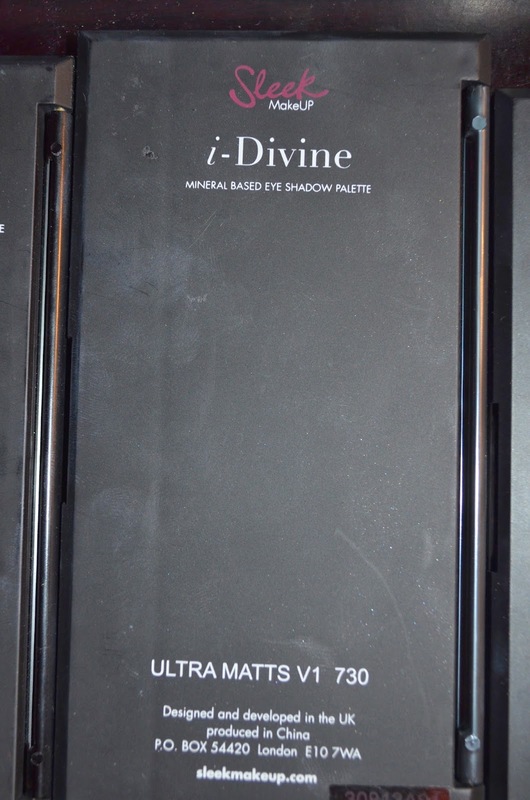 Second this is a Press Pigment Palette by URBAN DECAY, not an EYESHADOW Palette and the reason for that is because four of these Pigments are not USA FDA approve, but have been approved in the EUROPEAN market. The four pigments not approved for IMMEDIATE EYE AREA are SlowBurn, Savage, Jilt, and Urban but are usable everywhere else on the face. If you have sensitive eyes to eyeshadows or makeup, then this is NOT the palette for you, because it can irritate the eyes simply do to the colorant in the pigment.This palette retails for 49.00 through URBAN DECAY and SEPHORA, Links will be listed below, at the end of the blog. So the first thing I would like to cover is, the cover protection for your eyes. The first thing I did is apply a concealer, to my hand or eye, then the eye primer, then a white eyeshadow pencil, either NYx Milk or Jordanna white eyeshadow pencil. The reason for this, is because these press pigments are hugely pigmented and can stain your eye lids. So the more cover you do, as an eye base, the better you will be. These colors do blend really well and if your a makeup lover or a color lover these colors will work for you really well. These pigments will also add to your urban decay collection, especially if you just want one pop of color among your other URBAN DECAY palettes such as the NAKED Basics, NAKED, NAKED 2 or NAKED 3. I would like to add for those of you who are new to the URBAN DECAY brand; Urban was once known for their COLORs. So to have this press pigment palette is nothing new to this company. I was really excited when this palette came out because i notice the trend in makeup was starting to be bright colors especially for this up coming spring and summer. Now you might say, there is no such thing as trends for makeup but in actuality, there are trends everywhere. Another reason I was excited by this palette is because I am an art student and I love color. I will admit, I am new to makeup and do have a hard time with mixing colors and working them with my eye color but I have turn to youtube, where i do video blogs along with watching other youtube bloggers, do makeup tutorials. I will also be posting, some of my favorite youtubers at the bottom of this blog along with other links. So now on to swatches of the Urban Decay Palette. As you can tell from the pictures above, that this palette is highly pigment, and so worth the price. Also the Urban Decay Electric Palette will be permanently apart of Urban Decay Collection. I do believe and agree with other bloggers, that this palette needs to be reworked because it is to blue tone, and SlowBurn does not fit in well with the other colors. Now on to the SLEEK palette Ultra matte V1, Snapshot, and Acid. 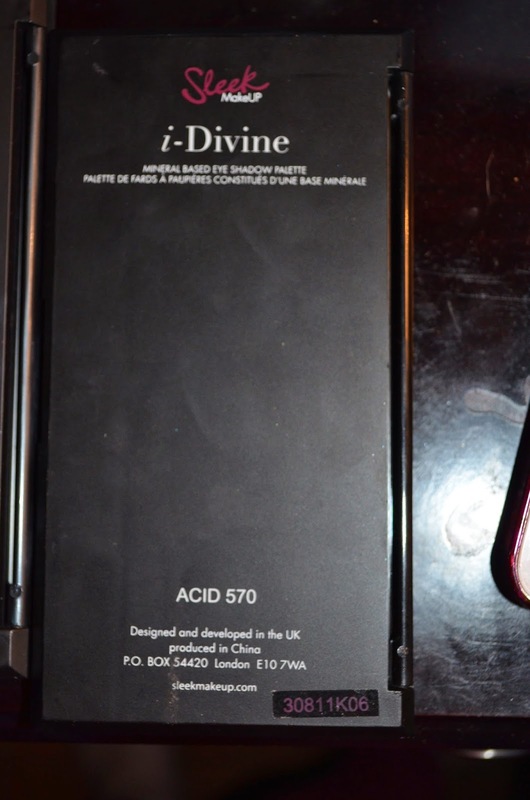 I am not paid or endorse to do these reviews from either SLEEK or URBAN DECAY. As for these Sleek palettes, in the USA, you can only find Sleek on Amazon because the company Sleek does not shipped these three palettes to the USA, due to the ingredients in them. The Ingredients in these Three Sleek Palettes are not USA FDA approved, they are only approved in the UK which is where Sleek is base and sold. I personally have used these three palettes and not have had a problem, but once again, please use these palettes and buy them at your own DIGRESSION. The reason I decide to compare these three Sleek Palettes to the Urban Decay electric, is because these palettes are at most 12.00 dollars total. All together I paid 32.00 for all three SLEEK palettes. All of the Sleek Palettes are Neon base to an extent. 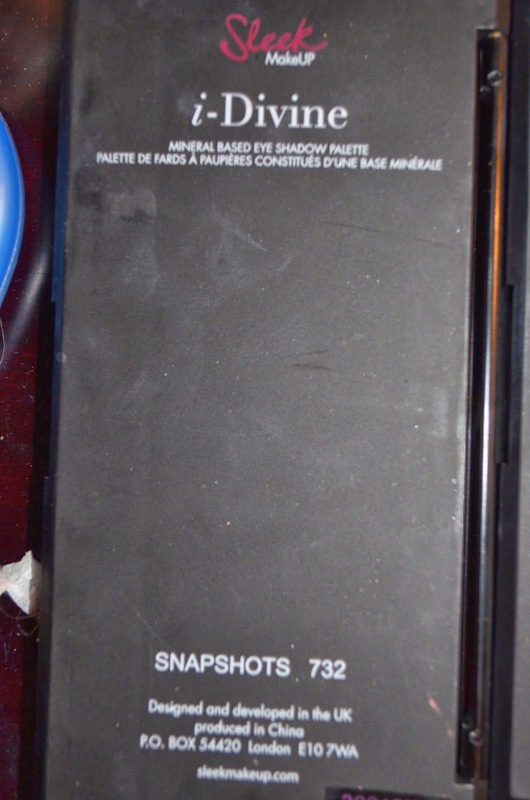 The Back of the SLEEK Palettes. All of these SLEEK palettes are brighter in person and some are darker in person, so don't be foul by these pictures. These shadows are beautiful and very usable for NEON looks or just bright looks in general. They can be wore with other palettes. 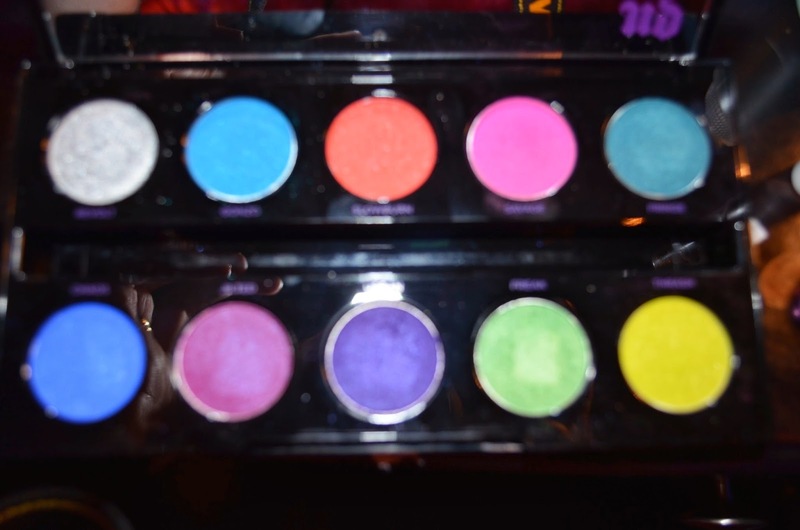 They are extremely pigment and very blend-able when using together or with other shadows. 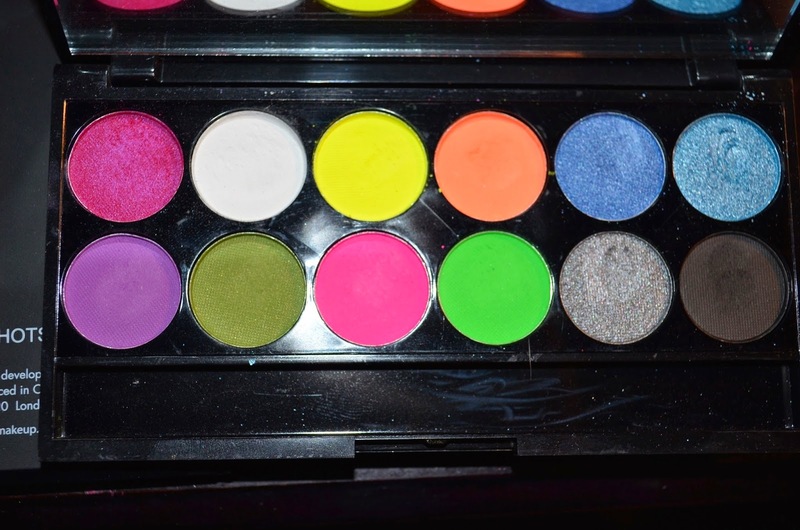 They are very much like the Electric Palette except the colors work well with one another and are not all blue tone like the Electric. I feel like with the SLEEK palettes, you receive a better color range then a all blue tone range like the Electric Palette. I am going to post examples from the snapshot and Ultra Matte V1 next. Snapshots is by far my favorite SLEEK palette, I love the orange-y, copper, reddish tones along with lighter colored tones. It is the most used palette by me because it works best with my blue eyes. I also like that is has matte and satin or shimmery tones in it. I do use this palette the most, it reminds me a lot of the KAT VON D palette, "Poetica". I also use this with my Kat Von D palette. The next palette from SLEEK is the Ultra Matte V1 with Swatches.